Whenever I have veggies that look on the verge of going bad, I roast them. 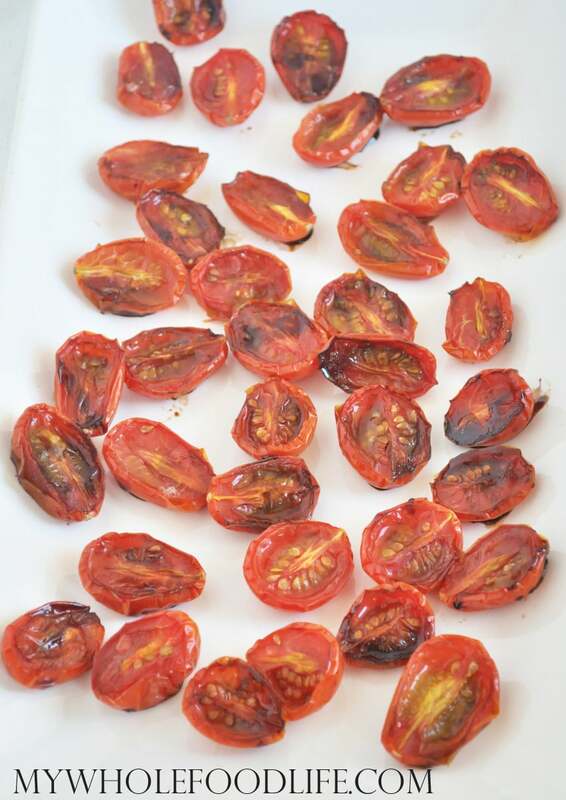 That is exactly what I did to these Balsamic Roasted Tomatoes. These are so delicious you guys! You can throw them in zoodles or regular pasta, add them to stir fries or just eat as a side dish. They are also good for homemade pizza. One of the easiest recipes you will ever make. I haven’t tried freezing these, so I am not sure if you could. If anyone tries, please let me know. I will be having these today with some avocado toast. Yummy!! An easy dish to add to many recipes! In a large bowl , toss the balsamic, oil and the tomatoes. Spread onto a lined baking sheet and sprinkle with sea salt. Bake for about 25-30 minutes. These would also be delicious with some basil and nutritional yeast added. Yum! They should last a week in the fridge. Enjoy! Would olive oil work as well, or did you already try and decide against it? Yes it will work, but I personally like olive oil for cold dishes only. Made these with whole grape tomatoes!! Saved a step, no cutting!! About 40 minutes for me, nicely roasted. Served as a side dish, and will be enjoying later this week!! I am going to make these tomorrow - they look so perfect!